I have been a patient of this office for about 8 years, and every time I had an amazing experience. They are always so welcoming and happy to help you. Once I missed my appointment and the next day they called me to make sure I was fine. The doctors and the PA are very knowledgeable, professional, and courteous. The waiting time is not more than 5 min. I truly recommend this medical center; very clean, organized, and great staff. They have always been consistent in their services. Dr Moya is amazing! Not only is he very knowledgeable and professional but he is AUTHENTIC…Something the health industry has lost. This is my 3rd time seen Dr Moya and the treatment has been very consistent. He is a living proof of what medicine used to be decades ago when your doctor listen and addressed your concerns. I really felt like he care about my concerns and me as an individual. I also want to mention that the facility is very modern, clean and efficient. Thank you Dr Moya !! These People Are Amazing!! And Quick! Very smooth process! I must say the environment was CLEAN and FRIENDLY. I’ve visited this facility a while ago and I’ve actually had a great experience and it takes a lot to impress me :-), but I was very impressed with the cleanliness, state of the art equipment, professionalism of the doctor and staff. I was grateful that they took the initiative to find me a physical therapist and schedule the appointment. Woo Hoo! I’ve never experience such great service from other facilities. You’re usually responsible for handling all the leg work. I will definitely be returning to this facility very soon and bringing my fiance’. Due to their extended hours, you’re not forced to choose between coming to work late or leaving work early. Thank you Hallandale Medical Center for not making doctor appts such a hastle and keep up the good work! Very professional and polite staff. The center is excellent, great conditions and clean. 100% recommended. The service is great, the staff is friendly and they treat you like family. There is no waiting time and the facility is beautiful. A very professional ambiance and very friendly and courteous staff and doctors. Almost no wait to get passed to my appointment. And always taking care of every details for referrals to Specialists. I would not change to any other Clinic or medical center! Great friendly staff. Dr.Moya is very knowledgeable and caring. It is clean and sanitized. This is one of the best clinic I’ve been in my life. Finaly a place where you are threated like a human being and not a cattle. Thank you to the staff for being so nice and welcoming! They had no problem taking care of my medical for my immigration appointment. I had the most pleasant patient experience of my life with Ms. Abboud today. She was professional, delightful and asked pointed questions to get down to the cause of my medical issues. I was seen quickly and taken care of in a timely manner. I left with thorough instructions and couldn’t have asked for a better visit. As I have already expressed these marvelous medical team exerts on making each one of their patients a happy “camper”. They’ve been treating my mother (97) for over 2 years, my father for a year now and they have been so excellent that I decided to become their patient to. Awesome!! 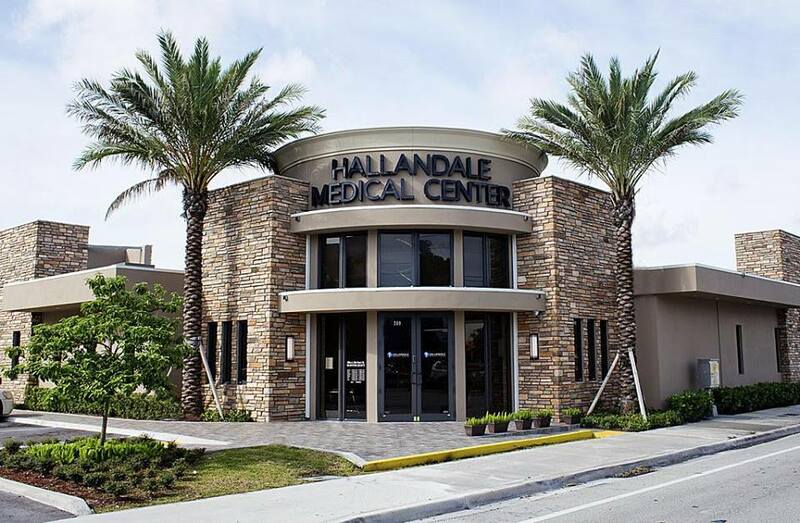 For over 30 years, Hallandale Medical Center has provided quality healthcare service to South Florida, including Hallandale Beach, Hollywood and Aventura. Our state-of-the-art facilities, accommodating hours and friendly staff are an essential part of our long-standing success. We offer a variety of comprehensive healthcare services, with a focus on family/internal medicine, geriatric care and mental health. We also offer Work Physicals and Immigration Physicals with quick appointments available. We consider every patient as a member of our extended family and enjoy serving generations of families at our practice. Our commitment to you begins the moment you step into our office. Geriatrics, Vaccinations, Immigration Exams, Physicals, EKG Services, Woman Exams, Injections, Lab-work, Procedures, Ultrasounds, Neuropsychology, Massage Therapy, Allergy Testing and more!